ill be your guide and trip leader. Andy has cycle-toured extensively across the United States and Europe, beginning with a 5 day roundtrip from Macon, Georgia to Jekyll Island when he was 16, followed by a ride from Georgia to Michigan 3 years later and a 2-week tour of New England a few years after that. He started a career as a NASA Rocket Engineer in 1986, but during vacations Andy organized and led week-long bike tours for friends in Napa, California, the coast of Maine, the Loire Valley, France, Wessex, the Cotswalds and Yorkshire, England, and of course in Kent and Sussex, southeast England. In addition, he has ridden with small cycling companies in England, The Czech Republic, Ireland, Italy, and Austria, and has done the well-known cross state BRAT, RAGBRAI, and Cycle Main Street, Louisiana rides. Andy knows how to find beautiful, quiet country lanes and fascinating and fun pubs, royal manors, gardens, old castles, grand cathedrals, historic sights, high tea shops, and great local food (scones!) 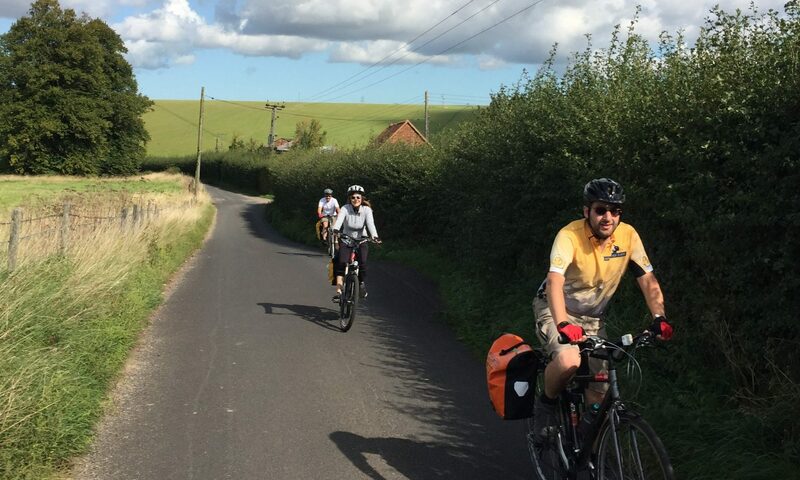 and beer that transforms cycle touring from being only about the bike to becoming a means of totally immersion into the history, culture, beauty, and friendliness of England. Andy is excited to be transitioning into this new adventure in his life. Cheryl Brown has accompanied Andy on many of his tours, and loves to engage the English people and to find the best that the small cities and villages have to offer, from coffee shops to antiques. She will be transporting the luggage and providing emergency van service.